Delta News & Review: The Bay Delta Conservation Plan: A Solution for the Future? The Bay Delta Conservation Plan: A Solution for the Future? California Water Series Part 5: The Bay Delta Conservation Plan: A Solution for the Future? Supporters say the Bay Delta Conservation Plan is one of the most ambitious habitat restoration programs California has ever attempted. But its proposal to build two tunnels to carry water from the Sacramento-San Joaquin Delta to central and southern California has also become one of the most controversial. On Bolden Island in the central Delta, excavators are filling trucks with dirt for a levee improvement project. The Delta has 1,100 miles of levees. Joel Dudas, a senior engineer with the California Department of Water Resources, says subsidence, where the level of land drops, is a constant threat. Levees are also vulnerable to sea level rise, extreme floods and the big fear – an earthquake. Saltwater would seep in. The pumps that export water would shut down. California’s agriculture and 25 million people who depend on the Delta’s water would lose it. For how long is unclear. Kightlinger says the Bay Delta Conservation Plan hedges against that scenario. The BDCP seeks to provide both a reliable water supply and improve the environment for 57 species of fish and wildlife. It proposes building two 30-mile long tunnels, each 40 feet in diameter. They would divert water from the Sacramento River using state of the art fish screens. The estimated price tag for the tunnels and the restoration: $25 billion. “We’re opposed to the tunnels because it’s bad for the Delta, it’s bad for the fisheries, it’s bad for Delta communities and it’s bad for California ratepayers and taxpayers,” says Barbara Barrigan Parilla with the group Restore the Delta. We’re at a Walnut Grove coffee shop where the group’s “Stop the Tunnels” signs are everywhere. One of the group’s biggest concerns is that the tunnels have a 9,000 cubic foot per second capacity. “The proposed tunnels with the three intakes right now have the capability of taking away almost 70 percent of the water, of what flows through the Sacramento River,” says Barrigan Parilla. But tunnel proponents say moving the intakes to the Sacramento River will prevent reverse flows at the south Delta pumps that kill fish. Secretary John Laird with the California Department of Natural Resources says there is a difference between capacity and actual operation. “That is something that’s lost is that people focus on what the absolute capacity might be.” says Laird. “In the 40 plus years that the State Water Project has been there, the capacity has always been much greater than what legally or permit wise can be pumped,” he says. Recently the footprint of the project shrunk by half and its proposed path shifted away from some private lands to public, in part to placate Delta residents. Instead, the changes created a new battleground. On Staten Island, Dawit Zeleke with The Nature Conservancy looks over a flooded corn field. The island is a permanent wildlife refuge the Conservancy manages to protect the threatened Sandhill cranes. “15-percent of the Sandhill cranes that come down the Pacific flyway from Canada, Alaska come down here to overwinter,” says Zeleke. Under the revised BDCP, the tunnels would pass under the island. “There’s no question about it, construction of a tunnel under this island is going to be disruptive,” he says. Zeleke says the Sandhill cranes bond to one location every year. 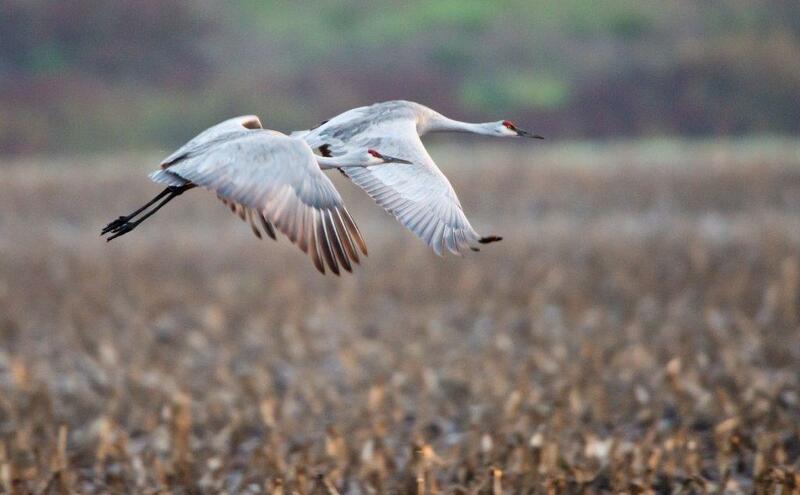 State agencies say they could manage construction when the cranes aren’t migrating. But Zeleke isn’t convinced. “They’re going to need a power line in here, they’re going to need a construction pad, there’s going to be boring equipment. And we don’t know what they’re going to pull out of the ground once they start excavating,” he says. The Nature Conservancy believes it could support the BDCP if the project improves all habitat types for all threatened species. When asked if he was hopeful that the BDCP is the solution, Jay Ziegler, policy director at the Nature Conservancy just sighed. “It’s the consummate challenge in California’s water equation,” says Ziegler. The California Department of Water Resources says there is no scientific certainty about how to best operate the proposed tunnels to recover fish species and maintain an adequate water supply. California Natural Resources Department Secretary John Laird says ultimately restoring the health of the Sacramento-San Joaquin Delta and making the BDCP a success will require trust. Draft environmental documents will be available for public comment in November.